My name is Natalia, I am 30, and I am creative director in Young and Rubicam Madrid. I am just writing here cause i dont know how I ended up in this blog!, and suddenly discover that the WWF print is graphically very similar to the one I did two years ago for "Survival international" ; it was call "Roots" and won silver lyon in cannes. Is this print from your agengy? I am very interested in Danish creativity, cause I am in love with Denmark, and I will really like to work there for a short period of time on the future. I am really interested in wich one is the most creative boutique there? I am sorry I can't help you with the design question. We were not involved in the production of this report. If you're coming to Denmark do give me a call and maybe we can drink a coffee together and chat. 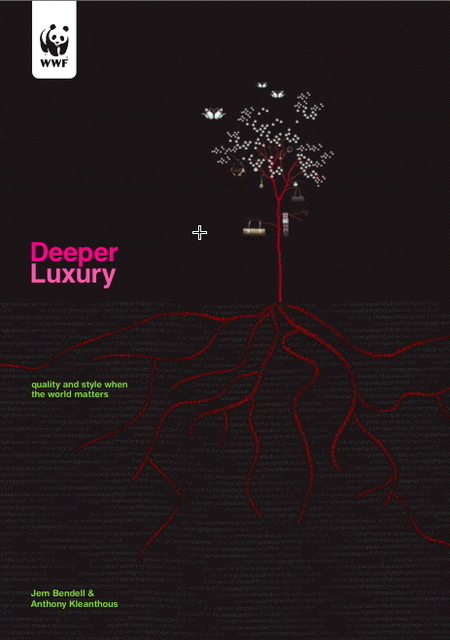 The consumption of luxury products it's kinda weird, it needs a deep study to clear all doubts. Why people spends their money in these kind of products,it's a real shame for our society. Deeper and more realistic approach would require the luxury of really excellent social and environmental performance, consumers are waiting for the excellence of this.